Note: This page reflects the current products available from R.L Schreiber through Marvin's Produce. 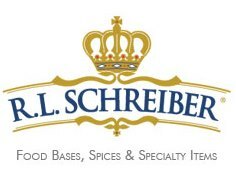 A full catalog of available products can be found at http://www.rlschreiber.com. If there is a product that we do not currently stock and you would like us to stock it for you please contact Marion Kirby at with a full description and I will return you email with price and availability; i.e. Vanilla Powder 12oz jar.